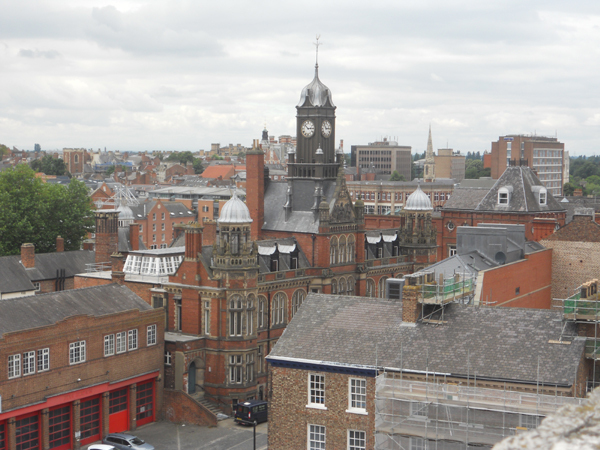 Our first experience with York in England was a both lacklustre and whirlwind. We stopped briefly on our way to Edinburgh on a family road trip. We only had time to catch lunch and visit the Jorvik Viking Centre before we hit the road again. My husband and I both agreed we wanted to see more of the city, as it has quite a rich history. When the time came for us to leave England, we set aside three days to visit both York and Edinburgh again. This time we took an overnight stay in York. Visiting England was educational in a lot of ways, especially as a fantasy writer. It isn’t uncommon to write fantasy on an epic scale. I believe there’s some castle or another in Game of Thrones that has something like a hundred hearths in the grand hall. And living in the modern world, we imagine our epic fantasy on scale with modern cities that sprawl across the landscape. But actually, medieval cities were small. They had to be; no one had cars, of course, and few people living in the city had horses. You had to be able to walk from one end of the city to the other and back within a day. So everything in the medieval city was within easy walking distance of everything else. Incidentally, this makes a city like York an ideal tourist city because you can hit all the major sights by just taking a walk around the city. 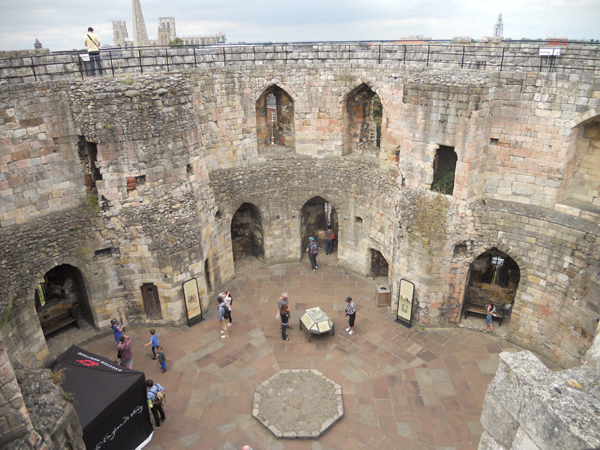 Our first stop was the location where York’s medieval castle once stood. It sits atop an impressive hill, which makes it visible from great distance. Unfortunately, to visit it, you have to hike a truly terrifying set of stairs. 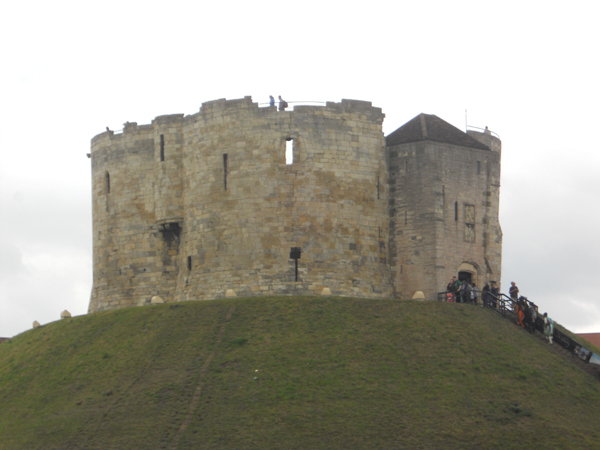 All that remains of the former castle in York is Clifford’s Tower and, of that, only the outer shell remains. This consists of a roughly circular wall which would have been manned by the city guard. The inner portion of the structure would have been made of wood (you can see holes in the brick where the wood structures were joined to the walls), however they’ve long since burned down. Aside from the wall, the only remaining portion of the building is the medieval chapel (because it was built into the wall). Navigating Clifford’s Tower meant scaling some of the most terrifying staircases we experienced while in England (and they have some really frightening stairways, I’m telling you). But it was worth it for the magnificent view of the city. Perhaps one of my favourite stops, on any of our trips, was our visit to the Shambles. 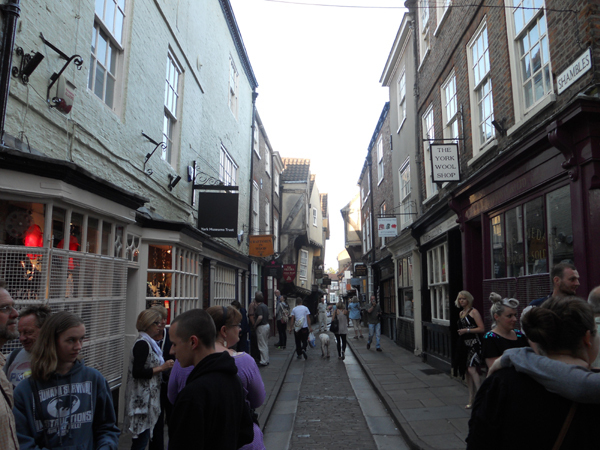 The Shambles is an alley in York which still looks the same way it did in medieval times. The roadway is narrow (no cars can drive down it, pedestrians only), and paved with small cobble stones. This paving is uneven and the stones stick up. Actually it can be somewhat painful to walk down, though the tops of the stones are obviously worn from foot traffic. It is lined on either side by local businesses. The buildings are pressed so close together that they’re pretty much like a wall of store fronts, but the roofs aren’t all even (because not all the buildings are the same height). Nor are the store fronts built consistently distant from each other on opposite sides of the road. They almost seem to lean toward each other. In fact, there’s one point where the roofs are so close together, it would be easy to imagine someone leaping across the alley via rooftops. It’s hard to do the experience justice with words. There are lots of touristy places you can visit in York, but we tried to focus on the historical sites instead. We didn’t, for instance, visit the York Dungeons because it’s really just an overdressed tourist area. 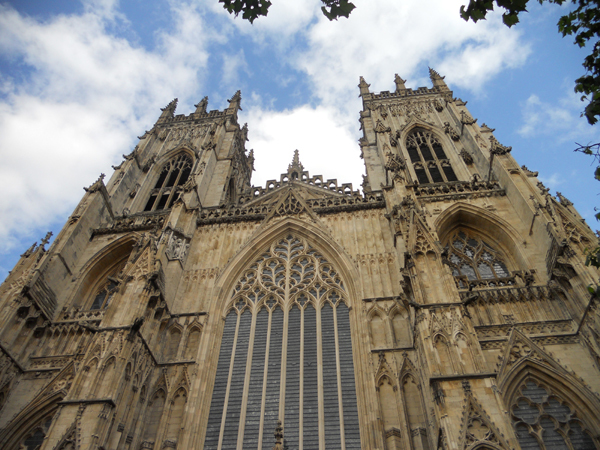 But we did spend quite a bit of time wandering the outside of York Cathedral, admiring the architecture and carvings. 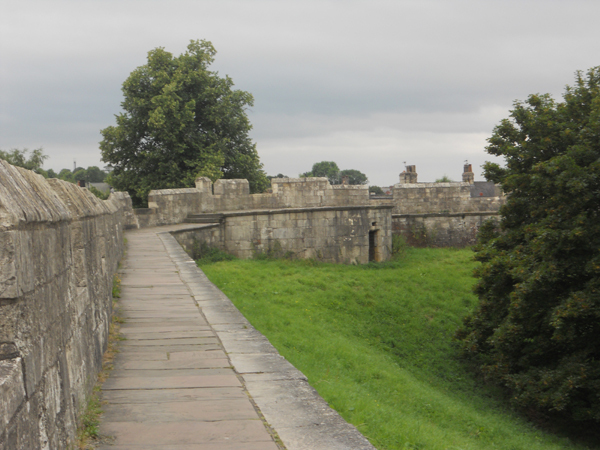 Before we left the next morning, we took a walk atop the wall which served as medieval York’s boundary. Much of it remains, though now it winds its way through the city. This was one of the most educational experiences for me, as a writer. Especially with a history major explaining to me how everything would have worked in ye olde days. Inside the wall would have been the city we had walked, of course. But outside it would have been mostly open land and farms. The guards would have been able to see trouble coming from a long way off without the modern buildings built in the way. I got a real sense of size and scale; for the first time, I could truly put myself into the world of my stories in a realistic fashion. We saw larger and flashier historical buildings elsewhere, but the hubby and I both agreed that walking the medieval city of York was a memorable experience.